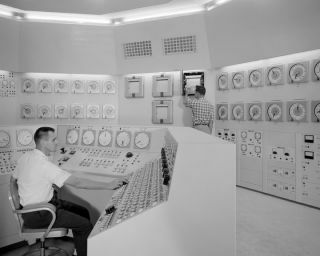 Two men sit in the control room of the Plum Brook Facility in 1969. In this historical photo from the U.S. space agency, Bill Fecych (seated) and Don Johnson work in the reactor control room during its operating days in 1959. After an ad hoc committee study in 1977, NASA Headquarters decided that the reactor would never be put back into operation. Reactor equipment was then "cannibalized" for other programs.